ABSTRACT: In this paper I explore the use of rhythmic analysis in relation to performance decisions for a coaching of Mozart’s String Quintet in E-Flat Major, K. 614, first movement. The analysis proposes a “basic rhythmic shape” for this movement, addresses issues involving phrase rhythm (phrase structure in relation to hypermeter), and presents possible responses to these observations in performance. Years ago I had the distinct privilege of coaching five members of a major symphony orchestra in a rehearsal of the first movement of Mozart’s String Quintet in E-Flat Major, K. 614. Although I had spent many hours contemplating this movement when analyzing it for my doctoral dissertation, I wondered about which aspects (if any) of my very detailed analysis might be of value in preparing suggestions for the performers. I thought back to the words of Edward T. Cone, who suggested that the key to meaningful interpretation lies in understanding “the rhythmic life of a composition” (Cone 1968, 31). In the past few decades we have witnessed a dramatic rise in the number of analytical studies devoted to musical rhythm (particularly as it relates to pitch structure) and more authors are paying attention to how such analytical insights can inform and enliven musical performance. (1) It is the purpose of the present study to explore this area, using the first movement of K. 614 as a test case. My coaching of this movement with the string quintet was recorded, and several excerpts from that recording session are included as MP3 files to accompany the musical examples. My methodology will follow Heinrich Schenker’s ideas about rhythm and meter, as explained by Carl Schachter and William Rothstein. (2) In my discussion I hope to strike a balance between a consideration of higher-level rhythmic structures (phrase structure and hypermeter) and the treatment of rhythms that occur on the musical surface; indeed, I intend to illustrate the interaction of these. The principal goals of the analysis are: (1) the identification of a “basic rhythmic shape” for a given passage, which may be enhanced in performance by slight adjustments in tempo, intensity, or duration (Wallace Berry’s terms tempo and articulation [Berry 1989, 2–3]); (2) the exploration of how this basic shape interacts with other materials, and how this interaction may affect performance; and (3) a consideration of rhythmic structure in relation to pitch structure, including the explanation of passages in which the phrase rhythm contains an irregularity due to the compression or expansion of measure groups, and possible responses to these irregularities in performance. The brs can be described as a Vierer—Joseph Riepel’s term for a four-unit grouping in his Anfangsgründe (Riepel 1754, 3); in our case, there is special emphasis on the third unit through a local phenomenal accent. (6) Although our first examples of the brs pertain to the beat level, I will argue that the brs can also operate recursively over higher levels of rhythmic structure, with phenomenal and/or structural accents on the third of four durational units. (7) A consideration of phrase rhythm in its broader outlines in the first theme of K. 614 will provide an illustration of how this can occur and will further inform a sensitive performance of the passage. Carl Schachter addresses a similar issue involving phenomenal and structural accents in a Vierer in his insightful analysis of the Minuet from Beethoven’s First Symphony (Schachter 2000, 59–68). Schachter observes these accents on the even-numbered downbeats of the quadruple hypermeasures of the opening theme (e.g., measures 2 and 4); these accents, of course, are in conflict with the natural metrical accents on the odd-numbered bars of each four-bar unit. This conflict is resolved by the conclusion of the Minuet portion of the movement when the structural and phenomenal accents are brought into proper alignment with the hypermeter. His approach to the Vierer in the Minuet thus differs somewhat from my approach in the Mozart Quintet, since my brs does not strongly contradict the given meter or hypermeter, and the brs operates on many different rhythmic levels, from dotted-quarter-note beat to quadruple hypermeasure—and beyond, as we will see below. The transition and second theme of K. 614, I are shown in Example 4. An MP3 of the coached performance is again provided. As indicated by the numbers above the music, the transition (measures 20–38) can be viewed as a single phrase of eight measures, with several expansions. The seventh and eighth measures of the unit (measures 26–27) are repeated in measures 28–29 and 30–31; the final repetition of the eighth basic bar at measure 31 is extended by an eight-measure unit prolonging V of B in measures 31–38, which establishes its own surface duple hypermeter. The local reinterpretation of measure 31 as strong bears upon performance: I asked the first violinist to treat measure 31 as a “new beginning.” The absence of any specific dynamic markings except for the initial forte in each instrument raises questions about the shaping of the various segments of the transition, questions that might again be answered by an examination of the rhythmic issues in this section. In addition to providing the customary modulation to connect from first to second group, the transition also contains a rhythmic link between the principal thematic areas, involving Mozart’s treatment of idea x. The motive in its original form (now called x1) begins in measure 20 in the second viola, then is imitated in the first viola in the following bar. The latter statement (labeled x2) commences, in effect, a beat early, shifting the first trilled neighbor note to the strong beat in measure 22. This shift has several important consequences. First, it prepares the rhythmic pattern for x3 found in Theme II in measures 39–40, where the neighbor (without trill) again appears on a strong rather than weak beat. Second, it sets up a substantial surface emphasis on measure 22, the strong measure, and a complementary release for measure 23, the following weak measure. (This pattern of stress and release correlates well with the harmonic pattern of dissonant dominant seventh in measure 22 resolving to consonant triad in measure 23.) As a result, the brs may be heard at the bar level in measures 20–23, and the pairs of bars which follow in sequence (measures 24–25 and 26–27) can be understood as a response to 22–23, with similar shaping by the performers (stress for the strong bar, release for the weak bar). The expansion of the F major chord in measures 31–38 contains clear references to the basic rhythmic shape at the beat level. As shown by the circled pitches in Example 4, the basic pitch contour at the dotted-quarter-note level in first violin and first viola, measures 31–32 and 33–34, suggests the pattern 1 - 2 | 3 - 4 , with an appropriate crescendo into the downbeats of measures 32 and 34. For the dynamic curve of measures 31–38 as a whole, the brs is again appropriate, now at the two-bar level: I directed the performers to begin at mf for measures 31–32, increase to f for measures 33–34, then peak at ff in measure 35 (the beginning of the third pair of bars). A decrescendo back to mf in measures 35–38 is appropriate for the descending register transfer in Vln. I, and also leads smoothly to the piano dynamic level for Theme II. In contrast to the irregularities of the transition, the second theme is quite stable and regular, consisting of a parallel period with eight-measure antecedent and consequent phrases. The melodic structure comprising a descending fifth-progression, with interruption, is typical for a period of this kind. As mentioned previously, the variant x3 appears in measures 39–40, its upper neighbor note now sounding on a strong beat (measure 40, beat 1)—a pattern first established with x2 in the transition. However, the motive is now stabilized metrically with the addition of a downbeat eighth note at measure 39. This addition enables x3 to begin on a strong bar, unlike the situation at measure 21 of the transition. As a consequence, the variant of idea x at the beginning of Theme II is the most stable version encountered. The added downbeat also creates the brs at the beat level, the accented incomplete neighbor sounding on the third beat of the four-beat group, as shown. (11) The same dynamic curve may be used for virtually every two-bar group of the theme, thus reflecting its high degree of rhythmic stability. 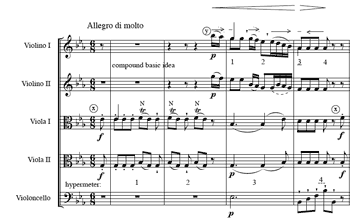 Example 5 summarizes the metamorphosis of idea x throughout the exposition, showing how its motivic material is shifted first to the left (transition), then to the right (Theme II) in relation to the prevailing duple hypermeter. Note that in the closing material, x4 retains the same metrical position as x3, but without the strength of the added downbeat heard at measure 39; hence, the statement of x4 beginning in the second half of measure 54 pushes to the downbeat of measure 56, producing the shape (1) - 2 | 3 - 4 , 1 at the dotted quarter-note level. This subphrase is clearly out of phase with the hypermeter, and offers the greatest contrast to the basic shape heard in x1 and x3. (12) In the codetta (measures 78ff.) the brs is reinstated for x5 at the close of the exposition. I asked the quintet to shape each of these variants of x carefully, as stipulated in Example 5. (13) Given the high degree of surface redundancy for this motivic idea, the performers appreciated the variety of approaches to its execution. A play between regularity and irregularity characterizes the development section (Example 6; MP3 provided). In measures 78ff. the duple hypermeter is shown at the bottom of each system, while the counting of half-bars is listed under Vln. I. As mentioned previously, the statements of x5 in the codetta, measures 78–79 and 80–81, suggest the brs in performance. 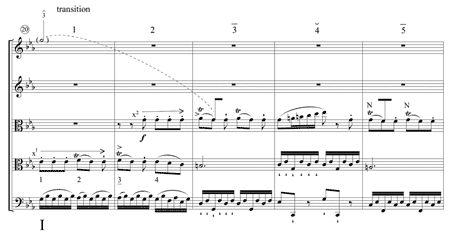 As the motive is fragmented in measures 82–86 the trilled neighbor note begins to appear on both strong and weak beats, with a final “spinning out” in first violin (measures 84–86) that expands the phrase and creates a sense of hypermetrical disorientation. The repetition of the expanded unit in measures 87–89 to facilitate a sudden tonal shift increases the effect of this instability. (14) To enhance this ambiguity, I suggested a slight crescendo that pushes to the end of each expanded hypermeasure, followed by a slight exaggeration of the rests in measures 86 and 89. In measures 97–99 and 107–109, where similar expansions occur using x2 and its fragments,(15) a different approach is warranted: since the shape of x2 pushes into a strong downbeat and then recedes, a decrescendo is appropriate. It was also important for the performers to recognize that measures 97 and 107 are strong bars, as a consequence of the one-measure expansions that precede them. The material in measures 119–124 might have presented a situation similar to the one at the beginning of the development, where a series of x5 fragments obscured the hypermeter. Instead, Mozart restates the material from measures 84–86 as measures 122–124; ironically enough, this material—originally disruptive at measures 84–86—is no longer in conflict with the duple hypermeter, since it begins on a weak bar rather than a strong one. This change at the close of the development section provides a stronger point of reference for idea x1 at the beginning of the recapitulation: if the performers strongly present duple measure groups in measures 119–124, the duple shaping for x1 in measures 125–126 (using the brs) now seems quite appropriate, and supports the same interpretation for x at the beginning of the exposition. A comparison of sketch a with sketches b and c allows us to ascertain relationships between durational events and tonal events, as a method of perceiving the overall pacing of the section. For example, reduction a shows that the 2/4 hypermeasures combine in groups of four to form larger hypermeasures, indicated by the bold bar lines at measures 90, 100, 110, and 119. The first large hypermeasure contains the passing subdominant area, the second the mediant harmony; the third large unit (measure 110) comprises the motion from VI toward V, the fourth the prolongation of the dominant. The most interesting irregularities occur in the third hypermeasure of higher order, measures 110–118. First, a contraction reduces the second small hypermeasure to a single bar, measure 112; I asked the first violinist to be aware of the a 2 in measure 113 as a new hypermetrical downbeat. This interpretation follows the pitch structure (graph b), since a 2 initiates a descending fifth motion to d2 at measure 119. The descending fifth constitutes an unfolding into the inner voice of the V7, as shown. Comparing sketches a and b at this point, it may be observed that the initial pace of the descending fifth is one pitch per quarter-note value of the reduction (a bar of the actual score) in measures 113 and 114; the pace then slows to one pitch per two bars for f2 (measures 115–116) and e 2 (measures 117–118). The expansions of f2 and e 2 represent a “written-out decelerando,” to use Rothstein’s term (Rothstein 1989, 80–87). Once this expansion is recognized, we may ascertain that the B major chord in measure 116 is not the structural dominant, which only arrives at measure 119. Hence, the performers should not give undue emphasis to measure 116 (or measure 118), as the interaction of tonal and durational events clearly demonstrates. With regard to the pacing of tonal events for the development section as a whole, note that the substantive tonal motion—the move through VI back to V—is concentrated in the second half of the section, in the third and fourth large hypermeasures. Could the brs even be applied at the higher hypermetrical level, to encompass the entire development section (as proposed by the stress mark under the large numeral 3 at measure 110)? Such a viewpoint, is, to be sure, controversial; as Justin London and others have pointed out, it becomes increasingly difficult to perceive patterns of stress and release as musical units become longer and longer. (18) Yet, one cannot ignore the sudden acceleration in the rate of tonal motion in measures 110–118, after the relatively static harmonic content of measures 90–99 and 100–109. In working with the quintet, I suggested a push forward to the third large unit as climax, followed by a receding motion in the fourth unit as the dividing dominant is prolonged. In summary, I have attempted to illustrate an approach to musical rhythm in performance that addresses intricate musical details as well as large-scale rhythmic issues (i.e., phrase structure in relation to hypermeter), using my own coaching of the first movement of the Mozart E-Flat Major String Quintet, K. 614, as a test case. I leave it to the reader who listens to the recorded examples from the coaching session to judge whether or not my attempt has produced a musically successful result. Is the presence of a basic rhythmic shape in the E-Flat Major Quintet a special case, or might we discover the same construct at work in other pieces by Mozart, as well as other composers? I would not presume to make too broad a claim for the brs; after all, a pattern of accentuation that embraces so many different time spans is not likely to be duplicated in a great number of pieces. However, I can cite a few examples that merit further study along these lines. The first movement of Mozart’s Quartet in D, K. 499 (“Hoffmeister”) features a main theme with a brs similar to the one encountered in K. 614: 1 - 2 | 3 - 4, with a strong agogic accent on the third half-note beat in cut time (Example 8a). The second movement of Beethoven’s Quartet in F, Op. 59, No. 1 has been the subject of several rhythmic studies. In his analysis of its principal rhythm, Carl Schachter has pointed out the lack of “forward momentum” in its first two bars, followed by a sixteenth-note push into the fourth bar;(19) using the approach in the present study, we could assign the brs 1 - 2 - 3 - 4, as indicated in Example 8b. 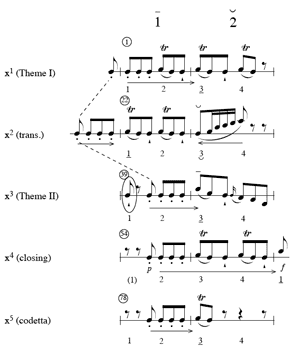 Interestingly enough, Dave Headlam has shown how “the higher-level rhythmic organization of the first key area is a large-scale reflection of the structure of the principal rhythm”: after the initial antecedent phrase (measures 1–8), a series of three consequent phrases (that he labels consequent 1, consequent 2, and consequent 3) are needed before the music “breaks through” to its harmonic goal, V/V, in the following transition (Headlam 1985, 121–22). Hence, cons. 1–cons. 2–cons. 3–trans. could also articulate the pattern 1 - 2 - 3 - 4, in the manner of the brs. Although the correspondence between the principal rhythm and the first key area is somewhat more selective than in the present study, the approach is certainly similar from a qualitative (if not strictly quantitative) standpoint. Some musicians fear that a detailed examination of a phrase may smother spontaneity and lead to self-consciousness . . . Maybe it really works the other way around. Perhaps spontaneity depends upon a real perception of the musical line and its possibilities . . . When a composer wrote a work, he felt the function of every note. The interpreter has to enter as much as possible into the composer’s creative workshop (Blum 1986, 149). Berry, Wallace. 1987. Structural Functions in Music. 2nd ed. Mineola, NY: Dover. Berry, Wallace. 1989. Musical Structure and Performance. New Haven and London: Yale University Press. —————. 1989. Musical Structure and Performance. New Haven and London: Yale University Press. Blum, David. 1977. Casals and the Art of the Interpretation. Berkeley: University of California Press. Blum, David. 1986. The Art of Quartet Playing: The Guarneri Quartet in Conversation with David Blum. Ithaca: Cornell University Press. —————. 1986. The Art of Quartet Playing: The Guarneri Quartet in Conversation with David Blum. Ithaca: Cornell University Press. Caplin, William. 1998. Classical Form: A Theory of Formal Functions for the Instrumental Music of Haydn, Mozart, and Beethoven. New York and Oxford: Oxford University Press. Cone, Edward T. 1968. Musical Form and Musical Performance. New York: Norton. Headlam, Dave. 1985. “A Rhythmic Study of the Exposition in the Second Movement of Beethoven’s Quartet Op. 59, No. 1.” Music Theory Spectrum 7: 114–138. Larson, Steve. 1983. “On Analysis and Performance: The Contribution of Durational Reduction to the Performance of J. S. Bach’s Two-Part Invention in C Major.” In Theory Only 7.1: 31–45. Larson, Steve and Cynthia Folio. 1991. Review of Musical Structure and Performance, by Wallace Berry. 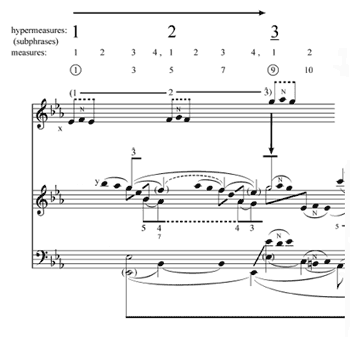 Journal of Music Theory 35.2: 298–309. Lerdahl, Fred and Ray Jackendoff. 1983. A Generative Theory of Tonal Music. Cambridge, MA: MIT Press. Lester, Joel. 1995. “Performance and Analysis: Interaction and Interpretation.” In The Practice of Performance: Studies in Musical Interpretation, ed. John Rink, 197–216. Cambridge: Cambridge University Press. London, Justin. 2004. Hearing in Time: Psychological Aspects of Meter. New York and Oxford: Oxford University Press. Riepel, Joseph. 1754. Anfangsgründe zur musikalischen Setzkunst. Vol. 1, De rhythmopoeïa, oder von der Tactordnung. 2nd ed. Regensburg: J. L. Montag. Rolf, Marie and Elizabeth West Marvin. 1990. “Analytical Issues and Interpretive Decisions in Two Songs by Richard Strauss.” Intégral 4: 67–103. Rothstein, William. 1989. Phrase Rhythm in Tonal Music. New York and London: Schirmer Books. Rothstein, William. 1995. “Analysis and the Act of Performance.” In The Practice of Performance: Studies in Musical Interpretation, ed. John Rink, 217–240. Cambridge: Cambridge University Press. —————. 1995. “Analysis and the Act of Performance.” In The Practice of Performance: Studies in Musical Interpretation, ed. John Rink, 217–240. Cambridge: Cambridge University Press. Rothstein, William. 2005. “Like Falling off a Log: Rubato in Chopin’s Prelude in A-flat Major (op. 28, no. 17).” Music Theory Online 11.1. —————. 2005. “Like Falling off a Log: Rubato in Chopin’s Prelude in A-flat Major (op. 28, no. 17).” Music Theory Online 11.1. Schachter, Carl. 1976. “Rhythm and Linear Analysis: A Preliminary Study.” The Music Forum 4: 281–334. Schachter, Carl. 1980. “Rhythm and Linear Analysis: Durational Reduction.” The Music Forum 5: 197–232. —————. 1980. “Rhythm and Linear Analysis: Durational Reduction.” The Music Forum 5: 197–232. Schachter, Carl. 1987. “Rhythm and Linear Analysis: Aspects of Meter.” The Music Forum 6.1: 1–59. —————. 1987. “Rhythm and Linear Analysis: Aspects of Meter.” The Music Forum 6.1: 1–59. Schachter, Carl. 2000. “Playing What the Composer Didn’t Write: Analysis and Rhythmic Aspects of Performance,” in Pianist, Scholar, Connoisseur: Essays in Honor of Jacob Lateiner, ed. Bruce Brubaker and Jane Gottlieb, 47–68. Stuyvesant, NY: Pendragon Press. —————. 2000. “Playing What the Composer Didn’t Write: Analysis and Rhythmic Aspects of Performance,” in Pianist, Scholar, Connoisseur: Essays in Honor of Jacob Lateiner, ed. Bruce Brubaker and Jane Gottlieb, 47–68. Stuyvesant, NY: Pendragon Press. Schmidt, Christoph and Naphtali Wagner. 1999. “KV 614: Schock und Struktur in der Wiener Klassik [K. 614: Shock and structure in Viennesse Classicism],” trans. Katharina Berger and Ludwig Holtmeier. Musik und Aesthetik 3.10 (April 1999): 28–46. Temperley, David. 2003. 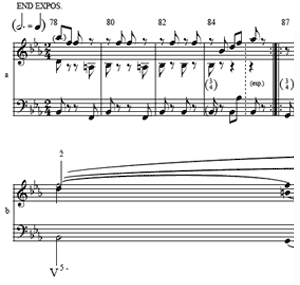 “End-Accented Phrases: An Analytical Exploration.” Journal of Music Theory 47.1: 125–154. Türk, Daniel Gottlieb. 1789/1982. Klavierschule or School of Klavier Playing: Instructions in Playing the Clavier for Teachers and Students, trans. Raymond H. Haggh. Lincoln, NE: University of Nebraska Press. 1. For example, Steve Larson (1983) has applied durational reduction in making performance recommendations for J. S. Bach’s C-major Invention; Marie Rolf and Elizabeth West Marvin (1990) have included hypermetrical analysis in their interpretive comments for two songs from Richard Strauss’s Opus 27. William Rothstein (1995) has discussed hypermetrical conflict in Chopin’s A Major Waltz, Op. 42. Two more recent studies are important antecedents for the present article: Carl Schachter’s brilliant treatment of “rhythmic imbroglio” in the Menuetto from Beethoven’s Symphony No. 1 (2000, 59–68) and William Rothstein’s insightful discussion of rubato in Chopin’s Prelude in A Major (2005). 2. Carl Schachter 1976, 1980, and 1987. William Rothstein (1989) offers a particularly comprehensive approach. 3. In this I would disagree with Wallace Berry’s strictures against relying on intuition (1989, 217); rather, I see pure intuition and pure analytic reasoning as extremes of a continuum, where the broad midsection of this continuum contains a field of “play” where intuition and analysis can interact with one another in an interdependent fashion. For a similar view, see the review of Berry’s Musical Structure and Performance by Steve Larson and Cynthia Folio (1991, 301). 4. These arrows and strokes, as well as the tenuto markings and hairpins at the top of each system in Example 1 (and in subsequent score excerpts), are my own suggestions; they are not part of the autograph score. The compression of short values in performance is discussed at some length by David Blum in Casals and the Art of the Interpretation (1977, 70–79). Though one might assume that Casals’ recommendations reflect a Romanticized approach to the execution of Classic music, treatises from the later eighteenth century do address this issue. For example, in chapter 6, ¶48 of his Klavierschule, Türk recommends lingering on dotted notes, then shortening the notes that follow (1789, 350–351). Similar instructions can be found in Leopold Mozart’s Versuch (1756), ch. 12, ¶21, p. 224. 5. Strictly speaking, the concept under discussion here is really a basic accentual shape, where an accent is perceived on the third of four rhythmic pulses. I prefer the term basic rhythmic shape since it communicates the idea that a particular pattern of accent can apply over various time spans, imparting a dynamic contour to specific rhythmic patterns on the musical surface, as well as shaping units on higher levels of rhythmic structure. The brs is “rhythmic” in the sense that it affects the flow of musical time in a distinct manner. 6. According to Lerdahl and Jackendoff (1983, 17), a phenomenal accent is “any event at the musical surface that gives emphasis or stress to a moment in the musical flow.” Phenomenal accents are to be distinguished from metrical accents (strong beats within the meter) and structural accents (“caused by melodic/harmonic points of gravity,” particularly cadences). 7. This distinguishes my concept of the basic rhythmic shape—a persistent grouping pattern with an accent on one of its pulses—from the concept of basic (pitch) shape in the work of Schoenberg, Ratz, and Caplin: my brs can operate recursively over differing structural levels, while the previous approaches do not. 8. See Caplin (1998, 69) for a discussion of the model sixteen-measure sentence (with compound basic idea). 9. The melodic sequence in measure 13 is interesting, since it echoes the rhythmic pattern from measure 12 (with its agogic accent on the downbeat), which helped to clarify the best choice of shape for motive x in the opening measures. The repetition of measure 13 further emphasizes this source of clarification. 10. For a full treatment of progression and recession see Berry 1987. He also applies these concepts to excerpts from Chopin’s A Major Prelude, Op. 28, No. 7 and Bach’s Sarabande from Suite No. 3 for Unaccompanied Cello (1989, 36–39). 11. Though some readers might consider dynamic emphasis on dissonant tones to be a “Romantic” concept, performance treatises from the eighteenth century recommend this practice rather consistently. See, for example, Mozart 1756, 171 (ch. 9, ¶8) and Türk 1789, 340 (¶32). In a celebrated example from his Versuch, Johann Joachim Quantz divides dissonances into three classes (mezzoforte, forte, and fortissimo), all to be performed more loudly than their consonant resolutions: Quantz 1752, 227–230 and Tab. 24, Fig. 1 (the famous Affetuoso di molto). For a discussion of Mozart’s treatment of “eccentric” dissonances in K. 614 in relation to the theories of Schenker and Adorno, see Schmidt and Wagner 1999. 12. David Temperley (2003, 132–36) observes a preference for end-accented groups near to the end of sonata-form expositions. He discusses several examples of closing themes that feature end-accented phrases. 13. This entire discussion of motive x calls to mind William Rothstein’s 2005 treatment of the principal six-note Ur-rhythm in Chopin’s A Major Prelude (¶¶ 6–21). As in the present study, he adds right-pointing and left-pointing arrows on the music to indicate accelerando and ritardando. He assigns three different forms to the six-note motive in the Chopin Prelude, following Hugo Riemann’s terminology (¶¶9–10 and Example 2); motive x in the present study could also have a “complete” form (x1), an “incomplete” form (x5) and “over-complete” forms with extra pitches (x2 and x3). In fact, the brs in the present article could apply to Rothstein’s “over-complete” Ur-rhythm in his Example 2c, at the dotted-quarter-note level. 14. The lack of stability leads William Caplin (1998, 146–47) to interpret measures 87–89 as a “pre-core transitional introduction,” with the core of the development beginning at measure 90 (see his Example 10.6). I also consider measures 87–89 to be transitional in nature, with the development section proper beginning in measure 90. The fact that Caplin begins the development at measure 87 is more a difference in labeling than any real difference of opinion about how measures 87–89 function. Caplin goes on to analyze measures 90–99 as a sentential model (with presentation and continuation) that is repeated in sequence in measures 100–109 (with motivic liquidation in the continuation). 15. Actually x5, in the manner of x2, since the motive pushes to a strong beat 1 (rather than 3). Refer to Example 5. 16. I hear duple (rather than quadruple) hypermeasures as primary in the development for two reasons. First, Mozart begins the development by repeating a two-bar unit—not a four-bar one—in measures 90–93. Although these bars could certainly combine to form a four-bar group, he immediately obscures this perception of four-bar groupings in the following music by introducing the expansions in measures 96 and 99. The same sequence of events occurs in measures 100–109; moreover, the contraction at measure 112 and the six-bar large hypermeasure at the very end of the development also interfere with the perception of four-bar units. 17. First, the motion from the dominant (measure 78) to the mediant (measure 100) is embellished by a passing area in A major at measure 90. At the same time, the soprano moves from the outer-voice f2 (measure 78) to the inner-voice d2 (measure 100); the soprano voice is regained with the g2 at measure 107. The addition of the passing subdominant area at measure 90 requires further voice leading correctives to avoid parallel fifths: the G7 chord at measure 87 and the D at measure 97. Note that the bass B at measure 119 and the soprano a 2 at measure 124 are non-coincident, and connected by a diagonal line. 18. Basing his claim on empirical studies of “rhythmic perception and performance,” Justin London (2004, 27) claims that if the listener is to perceive regularly recurring attack points as part of a regular meter, the upper limit for the time interval between those attack points (the “interonset interval”) is 5 to 6 seconds. Given the very fast tempo of the first movement of K. 614, one can certainly make a case for hearing duple hypermeasures, but the entrainment of the large hypermeasures is questionable: although the interonset interval between large hypermetric beats is about 3 seconds, the numerous phrase expansions would create a non-isochronous cycle in measures 90–99 and 100–109, immediately contradicted by the contrasting contraction and expansions in measures 110–118. 19. Schachter 1976, 315–16, particularly his Example 13b. For example, Steve Larson (1983) has applied durational reduction in making performance recommendations for J. S. Bach’s C-major Invention; Marie Rolf and Elizabeth West Marvin (1990) have included hypermetrical analysis in their interpretive comments for two songs from Richard Strauss’s Opus 27. William Rothstein (1995) has discussed hypermetrical conflict in Chopin’s A Major Waltz, Op. 42. Two more recent studies are important antecedents for the present article: Carl Schachter’s brilliant treatment of “rhythmic imbroglio” in the Menuetto from Beethoven’s Symphony No. 1 (2000, 59–68) and William Rothstein’s insightful discussion of rubato in Chopin’s Prelude in A Major (2005). Carl Schachter 1976, 1980, and 1987. William Rothstein (1989) offers a particularly comprehensive approach. In this I would disagree with Wallace Berry’s strictures against relying on intuition (1989, 217); rather, I see pure intuition and pure analytic reasoning as extremes of a continuum, where the broad midsection of this continuum contains a field of “play” where intuition and analysis can interact with one another in an interdependent fashion. For a similar view, see the review of Berry’s Musical Structure and Performance by Steve Larson and Cynthia Folio (1991, 301). These arrows and strokes, as well as the tenuto markings and hairpins at the top of each system in Example 1 (and in subsequent score excerpts), are my own suggestions; they are not part of the autograph score. The compression of short values in performance is discussed at some length by David Blum in Casals and the Art of the Interpretation (1977, 70–79). Though one might assume that Casals’ recommendations reflect a Romanticized approach to the execution of Classic music, treatises from the later eighteenth century do address this issue. For example, in chapter 6, ¶48 of his Klavierschule, Türk recommends lingering on dotted notes, then shortening the notes that follow (1789, 350–351). Similar instructions can be found in Leopold Mozart’s Versuch (1756), ch. 12, ¶21, p. 224. Strictly speaking, the concept under discussion here is really a basic accentual shape, where an accent is perceived on the third of four rhythmic pulses. I prefer the term basic rhythmic shape since it communicates the idea that a particular pattern of accent can apply over various time spans, imparting a dynamic contour to specific rhythmic patterns on the musical surface, as well as shaping units on higher levels of rhythmic structure. The brs is “rhythmic” in the sense that it affects the flow of musical time in a distinct manner. According to Lerdahl and Jackendoff (1983, 17), a phenomenal accent is “any event at the musical surface that gives emphasis or stress to a moment in the musical flow.” Phenomenal accents are to be distinguished from metrical accents (strong beats within the meter) and structural accents (“caused by melodic/harmonic points of gravity,” particularly cadences). This distinguishes my concept of the basic rhythmic shape—a persistent grouping pattern with an accent on one of its pulses—from the concept of basic (pitch) shape in the work of Schoenberg, Ratz, and Caplin: my brs can operate recursively over differing structural levels, while the previous approaches do not. See Caplin (1998, 69) for a discussion of the model sixteen-measure sentence (with compound basic idea). The melodic sequence in measure 13 is interesting, since it echoes the rhythmic pattern from measure 12 (with its agogic accent on the downbeat), which helped to clarify the best choice of shape for motive x in the opening measures. The repetition of measure 13 further emphasizes this source of clarification. For a full treatment of progression and recession see Berry 1987. He also applies these concepts to excerpts from Chopin’s A Major Prelude, Op. 28, No. 7 and Bach’s Sarabande from Suite No. 3 for Unaccompanied Cello (1989, 36–39). Though some readers might consider dynamic emphasis on dissonant tones to be a “Romantic” concept, performance treatises from the eighteenth century recommend this practice rather consistently. See, for example, Mozart 1756, 171 (ch. 9, ¶8) and Türk 1789, 340 (¶32). In a celebrated example from his Versuch, Johann Joachim Quantz divides dissonances into three classes (mezzoforte, forte, and fortissimo), all to be performed more loudly than their consonant resolutions: Quantz 1752, 227–230 and Tab. 24, Fig. 1 (the famous Affetuoso di molto). For a discussion of Mozart’s treatment of “eccentric” dissonances in K. 614 in relation to the theories of Schenker and Adorno, see Schmidt and Wagner 1999. David Temperley (2003, 132–36) observes a preference for end-accented groups near to the end of sonata-form expositions. He discusses several examples of closing themes that feature end-accented phrases. This entire discussion of motive x calls to mind William Rothstein’s 2005 treatment of the principal six-note Ur-rhythm in Chopin’s A Major Prelude (¶¶ 6–21). As in the present study, he adds right-pointing and left-pointing arrows on the music to indicate accelerando and ritardando. He assigns three different forms to the six-note motive in the Chopin Prelude, following Hugo Riemann’s terminology (¶¶9–10 and Example 2); motive x in the present study could also have a “complete” form (x1), an “incomplete” form (x5) and “over-complete” forms with extra pitches (x2 and x3). In fact, the brs in the present article could apply to Rothstein’s “over-complete” Ur-rhythm in his Example 2c, at the dotted-quarter-note level. The lack of stability leads William Caplin (1998, 146–47) to interpret measures 87–89 as a “pre-core transitional introduction,” with the core of the development beginning at measure 90 (see his Example 10.6). I also consider measures 87–89 to be transitional in nature, with the development section proper beginning in measure 90. The fact that Caplin begins the development at measure 87 is more a difference in labeling than any real difference of opinion about how measures 87–89 function. Caplin goes on to analyze measures 90–99 as a sentential model (with presentation and continuation) that is repeated in sequence in measures 100–109 (with motivic liquidation in the continuation). Actually x5, in the manner of x2, since the motive pushes to a strong beat 1 (rather than 3). Refer to Example 5. I hear duple (rather than quadruple) hypermeasures as primary in the development for two reasons. First, Mozart begins the development by repeating a two-bar unit—not a four-bar one—in measures 90–93. Although these bars could certainly combine to form a four-bar group, he immediately obscures this perception of four-bar groupings in the following music by introducing the expansions in measures 96 and 99. The same sequence of events occurs in measures 100–109; moreover, the contraction at measure 112 and the six-bar large hypermeasure at the very end of the development also interfere with the perception of four-bar units. First, the motion from the dominant (measure 78) to the mediant (measure 100) is embellished by a passing area in A major at measure 90. At the same time, the soprano moves from the outer-voice f2 (measure 78) to the inner-voice d2 (measure 100); the soprano voice is regained with the g2 at measure 107. The addition of the passing subdominant area at measure 90 requires further voice leading correctives to avoid parallel fifths: the G7 chord at measure 87 and the D at measure 97. Note that the bass B at measure 119 and the soprano a 2 at measure 124 are non-coincident, and connected by a diagonal line. Basing his claim on empirical studies of “rhythmic perception and performance,” Justin London (2004, 27) claims that if the listener is to perceive regularly recurring attack points as part of a regular meter, the upper limit for the time interval between those attack points (the “interonset interval”) is 5 to 6 seconds. Given the very fast tempo of the first movement of K. 614, one can certainly make a case for hearing duple hypermeasures, but the entrainment of the large hypermeasures is questionable: although the interonset interval between large hypermetric beats is about 3 seconds, the numerous phrase expansions would create a non-isochronous cycle in measures 90–99 and 100–109, immediately contradicted by the contrasting contraction and expansions in measures 110–118. Schachter 1976, 315–16, particularly his Example 13b.